K2 ATTACK 2.0 MAIN / FRONT TRIANGLE RARE! / NEW / SHIPS IN 24HRS New old stock that's been in our warehouse for a long time from our buyout of K2 inventory. These are new replacement front triangles. Maybe you have an older broken one, or maybe you just want it in a different size for your teenager. Who knows? SPECIFICATIONS: Manufacturer: K2 Model: Attack 2.0 Main / Front Triangle only Frame size: 19" Material: 7005 Aluminum Alloy Bottom bracket: 68mm wide English threaded Compatible derailleur: 31.8mm, top pull Compatible only with the Attack rear swing arm (From the identical model) Seat post compatibility: 27.2 Rear triangles are always the same size, so if replacing this with a rear triangle from a different size, it'll work. Condition: New. 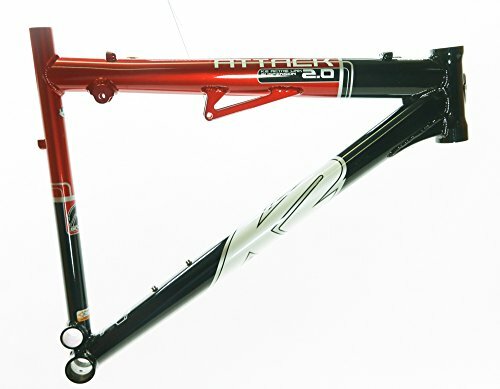 This frame is meant for someone who already has the complete bike, and just wants to swap out the front triangle Top tube length, center of headtube from center of seat tube 22.75" Headtube length 5.5" Seat tube length, center of BB to top 19"